~Schulz Sightings~: Airport Arrival for Drew Moses!! It was a Glorious homecoming! Did I mention hiring Kristin was one of the best decisions we made in this whole process?? What a treasure her gift is. Oh my word! There are none...except praise GOD from whom all blessings flow! I was crying by the second photo and sobbing by about the 15th. What a priceless, precious gift these photos are. I'm so glad your family is together. That picture of Preston kissing Drew on the cheek literally made my heart expolde. Congratulations to you all on your new, precious addition. Thank you, Lord for your gift of Drew!!! We love him so much already. This video, and the welcome itself, are so precious. It was awesome to physically see how many people you had praying for you to get through all the craziness of the process.... and there were many more, I know. Love you all!! welcome home dear friend! i cannot WAIT to meet your sweet child. praying for you and loving your heart for Christ and following His will. you continue to do that so well and it is such an inspiration to us. Awesome photos. You look amazing considering the long flight. Awesome video! Makes me so happy! You look great! Can't believe you flew from Africa and look that good! WHOOOOOOO HOOOOOOOOOOO awesome! So awesome! ORPHAN NO MORE! YES! So sweet of you to say Emily! I'm so thankful I was there and able to be part of documenting your journey for Drew and all your friends and family! Thank you for entrusting me with such special moments!! Emily - I was so excited to see your blog link on Elizabeth's facebook! What a beautiful addition to your beautiful family!! Ive been praying for you in the background as Id hear tidbits of updates from my dad!! You and your family are so blessed! So thrilled for all of you! 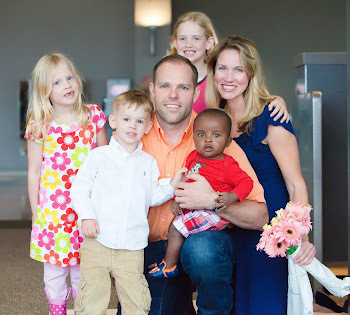 i found your story via another family's blog (they are patiently waiting to bring their baby home from africa). absolutely breathtaking! all of it...the images, the captured emotion, the welcoming committee, the love, your family all together for the first time...all of it is just beautiful. may god bless you with joy and strength! What a beautiful, beautiful family! Every adoption is a miracle and yours certainly is no exception. God bless you! Love this! And he is just so chubbalicious. And you do NOT look like you just got off a 70 hour flight. And I like the way your husband has his little Polo man exactly coordinate with his eyes. How beautiful! My husband and I have been following all your slideshows since we are waiting for our little one from Rwanda too. LOVE the everything glorious banner! So thankful for our God. I found this through It'sAlmostNaptime and I just had to tell you that I bawled happy happy tears through this whole video. I know we don't know each other, but I just had to say thank you for doing what you did and are doing and thank you for posting this! I about spit my coffee out when the last slide popped up I was so overcome! I am a friend/business partner of Elizabeth's and we just started our adoption Journey. She sent me your blog and I've spent my morning rejoicing in tears over your blog. Beautiful! Thank you for sharing your story.